Cheese is a favorite food for many people, it seems like cheese goes with just about anything. You can top your burgers with cheese or go for a cheese cake. Since cheese is found in so many different dishes and is a popular dairy product, it is probably a food that you crave from time to time. Even though many people find cheese to be appetising, there are those that do not think eating cheese is good for your health. Cheese might be a popular food, but it might be having an adverse effect on your health. Before you decide to cut cheese out of your diet altogether, it might be a good idea to take a closer look at the pros and cons of eating cheese. This will help you gain more information and decide for yourself is cheese is a food that you should be eating regularly. The essential nutrients that are most prevalent in cheese are proteins and calcium. Other nutrients that are found in cheese include zinc, vitamin A, and vitamin B12. This makes cheese a very nutritious options for people looking to consume foods with high amounts of calcium and proteins. Another great benefit of eating cheese can be noticed in your dental health. Since cheese contains such a high amount of calcium, it can help make your teeth stronger. Lactose is the ingredient in many dairy products that can be harmful to your teeth, but cheese contains very small amounts of lactose. This means that just snacking on cheese from time to time will actually help you to prevent tooth decay and will help you obtain stronger teeth. There are some people that struggle with maintaining their ideal weight. Cheese contains many natural fats that can be linked to weight gain. The best part about cheese is that the fats are natural and good for your health. Strengthening bones is something that cheese can offer in high doses. If you want the body to get high amounts of calcium that can be easily absorbed, you should be eating cheese often. Since many cheeses have a high fat content, they are also shown to put heart health at risk. Eating cheese has been linked to heart attacks and this means cheese can be harmful for your health. Cheese is Very Salty. 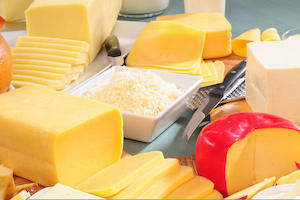 One of the biggest cons associated with eating cheese is the misconception that cheese is natural. Cheese might not be as natural as you think. Cheese consumption has actually been linked to a number of health problems in children. This means that giving your child cheese to help build healthy bones might actually be impacting their health negatively. Children that eat high amounts of cheese have been seen to develop chronic ear problems and even deal with many respiratory ailments. As you can see, both the pros and cons of eating cheese are important. Even though cheese is seen to be healthy for you in a number of ways, it can also put your health at risk in others. It is important to carefully consider the types of cheese that you consume and look to monitor the amount of cheese that you and your child eat. If you are looking to increase your calcium intake, cheese can be a great option. However, you do need to be aware of weight gain that does coincide with eating cheese regularly. If you each cheese sparingly, it should not impact your health in a negative way.